Another very strong storm system will approach our region Wednesday, bringing potentially scattered to numerous severe thunderstorms during the afternoon, overnight, and morning hours Thursday. The greatest threat risk area appears to be much of East Texas, Southeast Oklahoma, and western sections of Southwest Arkansas (graphic below). All modes of severe weather are possible; this includes large hail, damaging winds, and isolated tornadoes. 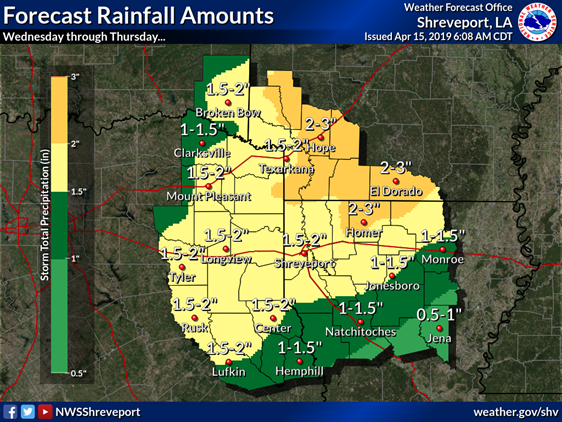 This storm system also has the potential to dump another 1-3 inches of rainfall, with locally higher amounts, over vulnerable areas of South Arkansas and North Louisiana. Impacts: Large hail, damaging winds, and isolated tornadoes are all possible areawide; flash flooding over South Arkansas and North Louisiana.